Advice on how to teach your puppy to stand, and how to groom at home along with short wash and drying sessions to introduce your puppy to the grooming process once vaccinations are complete. During the first grooming session, the main idea is to familiarize puppies with the process. The pup’s initial experiences at the grooming salon can set the stage for how he responds to being groomed for the rest of his life. So it’s important to make the experience as pleasant as possible. 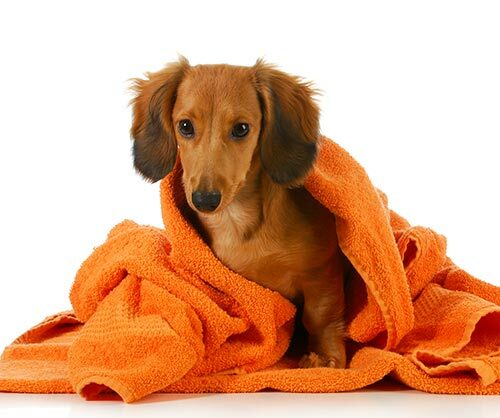 We can help owners to navigating the challenges of introducing your puppy to the grooming process by giving you some tips on preparing the puppy for what could be a scary experience. The more socialized and used to being handled a puppy is the better. On the big day, when the puppy first arrives we slowly introduce ourselves to the little one via speaking to him in a soft, soothing voice, petting and cuddling him and playing with him for a bit, to gain his trust, and to enable him to regard grooming as a fun, enjoyable experience. Above, all, patience is key. We stick to an abbreviated session, to avoid stressing the pups out and enabling them to get used to being handled. Plus, bear in mind that puppy may be frightened when they are first exposed to such alien devices and tools as clippers, noisy dryers, and grooming tables. Light trim where especially needed, such as around the face, feet and bum.